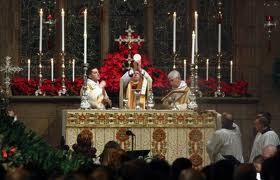 Elevation of the host at St. Mark's parish in Philadelphia, PA during the Christmas Midnight Mass. "1. In the formulas [of the consecration] that follow, the words of the Lord should be pronounced clearly and distinctly, as the nature of these words requires. "4. He shows the consecrated host to the people, places it again on the paten, and genuflects in adoration. "8. The Priest shows the chalice to the people, places it on the corporal, and genuflects in adoration." If we were to limit ourselves to a minimalist interpretation of the rubrics, we would have to say that there is no strict legal requirement to hold the host in both hands. However, the liturgical norms of the ordinary rite, even though they no longer describe each gesture in detail, tend to presume continuity in long-standing practice. Thus there is every reason to assume that when saying simply that the priest “takes the bread,” the legislator presumes that he will do so with both hands as is obligatory in the extraordinary form of the Roman rite. This is certainly the most natural practice and it is followed by the overwhelming majority of priests worldwide. Holding the host and chalice in both hands allows for greater pause, reverence and composure in carrying out this rite. As our reader points out, holding up the host with one hand can evoke an impression of nonchalance on the part of the priest with respect to the Eucharist. On the other hand this practice is perfectly justified when a priest is physically impeded, as was the case of Pope John Paul II who held up the host with one hand when he could no longer control both members. In such a case any lack of aesthetics is more than compensated for by the priest’s devotion to his ministry edifying and nurturing the faithful. Finally, it is important to remember that we are above all before a consecration narrative of the saving events and not before a historical narrative mime or drama. It is therefore liturgically incorrect for the priest to add dramatic gestures that are not described in the rubrics and have no basis in traditional Church practice. Some practices that crept into the liturgy, such as that of breaking the host while narrating Our Lord’s action of breaking the bread, have been explicitly forbidden in the instruction "Redemptionis Sacramentum." Others, while not specifically mentioned, fall under the same logic that motivated that prohibition. For example, some priests have fallen into the habit of making a gesture of offering toward the faithful with the host and chalice while saying “Take this, all of you.” The addition of such a dramatic gesture is unjustified from the point of view of the rubrics and tends to be quite distracting. "(1) The preparation of gifts (he took), (2) the Eucharistic Prayer (He blessed or gave thanks), and then (3) the fraction (he broke), and finally (4) the communion (He gave)." For this reason I believe that we can affirm that the Roman rite's characteristic sobriety and lack of dramatic flair is well-grounded in both theology and pastoral good sense. After our comments on the importance of the priest using both hands for raising the host after the consecration (see Sept. 30), a distinguished reader commented on a possible variant. He wrote: "Thank you for making your point so clearly about using both hands in the raising of the host and the other pertinent points you made. They are important and [...] give a proper decorum to the mystery being celebrated. "There may be a case for using one hand when the other hand holds the vessel beneath the raised host, as I often do. In other words, at the consecration the whole paten which is usually large and flat is raised slightly and after the consecration the big host is raised above the paten or dish and shown to the people. Then the dish is in the left hand and the raised host in the right." I would agree with our reader that this particular form would not lack reverence and decorum. The only caveat I would have is that raising the paten is not foreseen at this moment. The rubrics, in directing the priest to take the bread ("accipit panem") and deposit it upon the paten after showing it to the faithful, seem to presuppose that he physically handle the bread itself and not the paten. This would be in continuity with the Roman tradition as exemplified in the extraordinary form of the Roman rite. Likewise, raising the paten during the showing of the host, while not forbidden, is not mentioned at this point, whereas the rubrics specify two other moments when the paten should be or may be raised. Although the showing of the host and chalice after the consecration are central moments of the Eucharistic Prayer, liturgically speaking, the elevation of paten and chalice during the concluding doxology until the people have finished the final amen is of more importance. This is because it makes explicit the whole mystery of the sacred sacrifice's giving glory to the Father, through, with and in Christ in the unity of the Holy Spirit, whereas the symbolism behind the showing after the consecration emphasizes above all the mystery of transubstantiation. Raising the paten at the consecration might possibly make it harder to catechize the faithful regarding the full meaning of this moment of the Mass. The other moment when the paten may be raised is during the "This is the Lamb of God." At this moment the celebrant has a choice as to present the remaining fragments of the large host to the faithful above the raised paten, or above the raised chalice. In this case it should never be simply presented to the people without the paten or chalice as is usually done in the consecration. Several other readers pointed out that the celebrant's reverence, or lack thereof, toward the Eucharist at Mass is very often reflected in the behavior of other ministers and of some of the faithful. Above all they pointed out the effects on the liturgical and spiritual formation of children.